‘Holi’ is a festival of colors and is an important Festival of India which is celebrated with great enthusiasm particularly in North India. The festival falls on a full moon day of the Phalguna month according to Hindu calendar. Holi is also known as a ‘Spring Festival’ as it marks the beginning of the spring season which symbolizes joy and fun. The nature also looks green and rejoices the arrival of Holi. The fields get filled with healthy crops and the flowers bloom spreading their fragrance in the air. 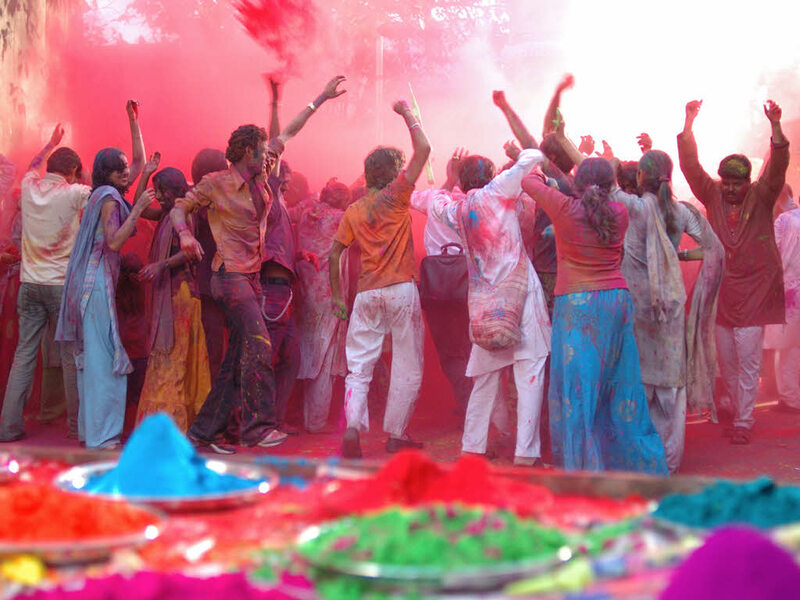 It is believed that Holi celebrations are dated back to several centuries before Christ. But in those days Holi was a special festival only for married woman who would pray god for the wellbeing of their families. The meaning of Holi is however changed over all these years and today Holi is more of playing in colors, having fun, and spraying water on friends. The celebrations of Holi start on the eve of the Holi which is also known as Choti Holi, when people come together at crossroads and light huge bonfires. This tradition is called ‘Holika Dahan’ which marks the victory of Good over Evil. The ash of the bonfire is considered sacred by the people and they apply it on the forehead and believe that the ash will protect them from the evil. On the of Holi the market place is flooded with people who want to purchase different hues of gulal which are a form of colored powder used for playing Holi. Children shop for the Pichkaris which is a form of water gun used to spray water and drench everybody. The women at home start cooking goodies like gujiya, mathri, papad, potato chips, and papri for the family and the guests who are expected on the day of the festival. On the next day that is on Holi, people dressed in light color clothes come in groups and apply ‘gulal’ on friends and relatives and take turns to pour water on each other. Dance and songs are an integral part of the festival. People also have a drink called Bhaang and dance to the tunes of the Dhol. Holi is celebrated in the month of March every year. The festival which was once celebrated only by the Hindu community today sees no caste, creed, and religion barriers today. The festival gets people together from different strata of life and binds them together in the celebrations. The festival is fun when celebrated with the right spirit but today it is seen that the Holi colors are no more organic and the chemicals in the color affect the skin, throat and eyes of the people. Also there are instances when men get drunk and misbehave in public with women which spoil the entire festive mood. Hence people should be aware of their limits and should play the festival of colors safely and return back home happily with beautiful memories.